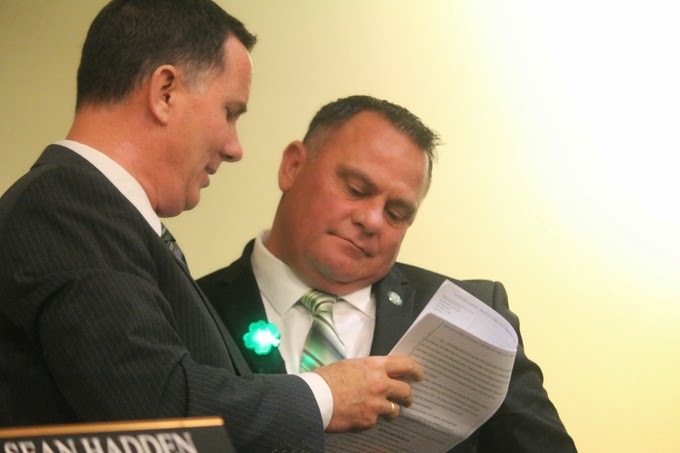 Murrieta City Council member Jonathan Ingram (right) looks over the copy of a lawsuit with Police Chief Sean Hadden during a recess in Tuesday night's council meeting. 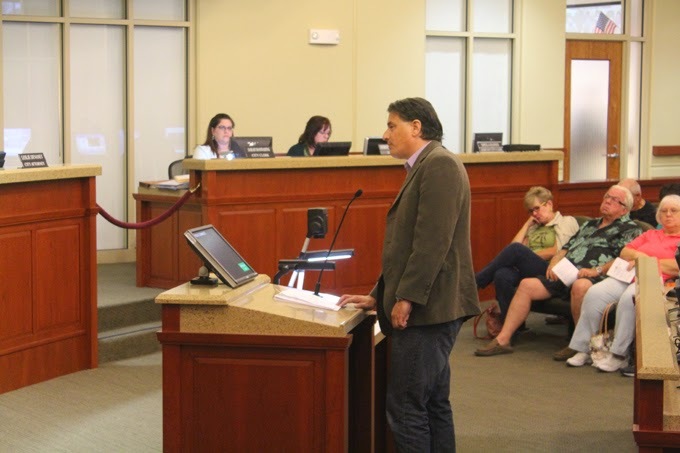 Council member Jonathan Ingram was served with a lawsuit moments before Tuesday night's Murrieta City Council meeting, and an attorney told council members during the meeting that his client has filed suit against both Ingram and the Murrieta Police Department, alleging civil rights violations and false imprisonment. Attorney Matthew Pappas (right) said during the public comments portion of Tuesday's meeting that his client, political consultant Jeffrey Benson, lost his job and has the been the subject of public ridicule because of an arrest by the Murrieta Police Department last October. The arrest followed allegations by Ingram during his City Council campaign that Benson was stalking and threatening him. According to a press release from Pappas' law office, "the lawsuit alleges Ingram urged the arrest to suppress the impact of documents Benson had obtained related to Ingram's past business dealings." The press release also stated that Benson lost his job as a school teacher following the arrest and "has been shunned because of the widespread publicity related to the case." The Riverside County District Attorney's office declined to file charges against Benson. Pappas said Benson was "participating in the political process and exercising his free speech rights. He's worked on campaigns for years. Using police authority to silence him was wrong." Ingram declined to comment Tuesday night, saying he had not had time to read the lawsuit.